I've noticed a few references to the Internet of Things recently, a phrase I haven't heard for about two years (Nicolas Nova notes its reappearance, in concept if not in name, here) and to Smart Cities, about which the Guardian weirdly had a pull-out advertising supplement a few weeks ago. I'm glad these ideas are back, just for fun if nothing else, because I like both of them. In between this time around and the last time around though I've done a bit of work with a neighbourhood police team, and one of the things that experience made me think was that if you wanted a working example of a real-time sensor-enabled city-wide "smart city" system then 999 calls in a city full of people with mobile phones is it. Think about it: you've got a very widely distributed sensor network, that's us with our eyes, ears and bodily presences which might be under threat, and that sensor network is being monitored in real time - we can ring 999 from anywhere because we have mobiles - and the alert from the sensor (us and our phones) triggers a response - flashing blue lights - that aims to restore the system to its balanced state. And it's this restoring the system to a balanced state which is by far the most important and illustrative part. The balanced state is a state in which no laws are being broken. And what are these laws? They are the rule sets for how we live together. And they are technologies. I'm not saying we have the right laws, or even that we need “the law” to live together, but we do need rule sets, many of which we act on without even knowing just from the look on someone else's face. I might also be misinterpreting (wilfully or through dumbness) Paul Romer's Long Now talk by saying he says rule sets are a kind of technology, but it's a useful idea, so if he didn't he should've. And this technology for living together doesn't just fall out of the sky, even if it might as well do, for all the say most of us have designing it. We have to choose what laws we want, what balanced state we want the system to be in (though if you read about autopoiesis that idea of choice isn't quite so clear!). And it is the rules for making and enacting those choices, the rule sets for making rule sets, for governance, the rule sets that are the constitutions by which we make decisions about how we want to live together, which are the real smart city technologies. A city isn't smart because it produces lots of data. Or even opens up that data to lots of developers. It's smart because it continually monitors itself and uses that feedback to maintain the state it wants to be in. It's worth remembering that the word “cyber” doesn't mean having metal arms, it means to steer. Cybernetics is the study of how to steer systems. So what state do we want the system to return to and how do we steer it? What do we want our technologies of governance to give us? Wealth? Happiness? Innovation? Fairness? Long life? Environmental sustainability? I don't know. You decide. Pick the ones you want. Then when we have deliberated, agreed and built those technologies - the constitutions and laws - we set up our sensor networks (made up of all sorts of technology - you can have a smart city without any rifd chips or data visualisations of real-time traffic updates whatsoever, just look at ancient Athens) to monitor the system and give us feedback so that we can adjust our smart city technologies - the rule sets of governance and the laws that are enacted - to give us more of what we want and less of what we don't. Or we can decide we want something else in which case we design new governance technology and enact new laws. And it's these technologies that are most desperately in need of innovation. Because at the moment they are awful. At the moment, how does the system of Great Britain, for example, decide what counts as the state it wants to return to? Every five years or so around 40% of the people in the arbitrary and outdated unit of organisation called "Britain"* who can be bothered to vote, people who are quite possibly mostly living hundreds of miles away from most of the other 60%, get a poll result that is roughly what they hoped for without really caring all that much either way, and a simple majority from a group of around 600 men and women out of a total of 60 million - whose job is now to design technology (rules sets, laws) for the whole arbitrary unit but who really all owe their allegiance to only one city (usually London regardless of whether they are meant to be designing technology to benefit the people of, say, Sedgefield) - then tell all the other cities (systems) what counts as the right state for their system and how to achieve it for the next five years or so before the next poll which might or might not lead to the reversal some of the previous rule sets. And that is a very dumb way to run a system. And it is the dumbness of the technology that makes me a little bit suspicious about the re appearance of smart cities (were they called smart cities last time, when it was that place in Korea? Maybe it was Ubicities?). Is it just a way for big, multinational technology companies to fleece the dumb city? Is it a way that by doing a bit of wining and dining of a few of the 600 people who at the time are designing the governance technologies, they can be persuaded to enact some laws to outsource, to these same big technology companies, something or other that we didn't even know we needed, in the same way in every city/system no matter how different, for dozens of years, because it's more "efficient". And call it "smart cities"? I don't know, but it's worth looking at the names of the companies paying for the pull out newspaper advertising supplements. This is a little bit like Adam Greenfield's argument in his book Everyware - this stuff is coming so we better debate it now while we've still got chance to decide what we want it to be like, because otherwise it will be decided for us. But debating "advancing and emerging digital technologies", as they did at this seminar in Manchester organised by consultants, is debating the wrong kind of technology. What we should be debating, and more importantly innovating with, is our governance technologies, the ways in which we decide the kinds of systems/cities we want to live in and the civic rule sets from which those systems/cities will emerge. If we do that, the rfid chips will look after themselves. And the people who should be debating and designing the technologies for their smart cities are the people who live in them. And they should be able to to debate and design, as often as they want, everything. Every. Single. Thing. Because you don't get any meaningful innovation, enterprise, responsibility, energy, commitment, problem solving, or engagement if you don't have the power to do things and the risk of failure when you do. And all sorts of people think it would be a good idea to innovate with governance technologies: Paul Romer, these bonkers Americans who want to live under the sea, the writer of this essay on local economics and places, and even this bonkers government minister saying we should have "home rule for cities". Because compared to governance technology, having a wheelie bin that gives me whuffie points when I put some tin cans in the recycling, or a mobile phone that tells me where the traffic jams are, or even a smart electricity grid, couldn't be more trivial**. ** As John Tolva, who is the director of “Citizenship and Technology” at well known philanthropic organisation IBM said at a city camp event the other day “burying the sensors in the pavement, that is easy”. "Would you buy a mixed reality narrative from these men?" Des and Tony at the Mid Yorkshire Region Used Car Dealers Association Annual Black Tie Gala Dinner Dance and Awards Evening with the coveted Best Reconditioned Family Touring Saloon Award. 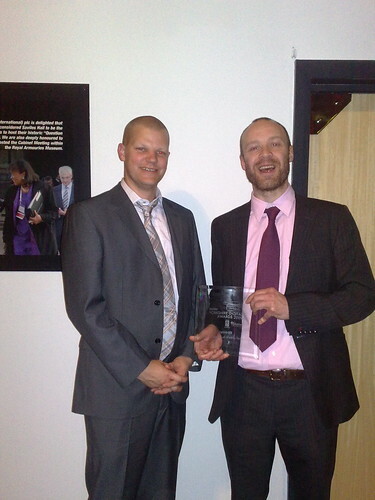 Five Trees Forest won the award for best use of mobile technology at yesterday's Yorkshire Digital Awards sponsored by 4iP. Massive credit goes to co-creators Common Agency and Andy Sykes for doing a brilliant job and for being able to put up with my relentless and unblinking ability to ask for crazy amounts of work on stories-for-mixed-realities about invisible worlds with almost invisible budgets. The life of Kookie . 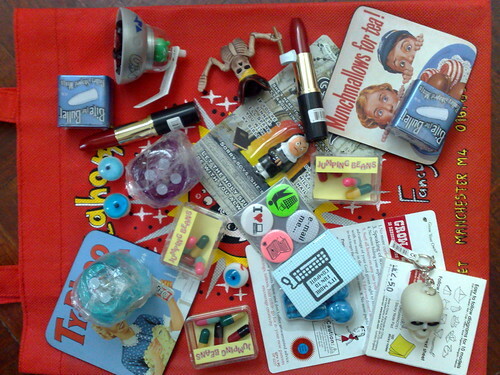 Forty three quids worth of knick-knacks from Oklahoma in Manchester to be won as treasure during this week's Five Trees Forest story. There is some cool and not-cheap stuff in there, especially the bouncy LED dice, which I'm sneakily hoping don't get won so I can have them. "Here is one I ate earlier"
One interaction I really wanted to have in Five Trees Forest was for two players to meet and for their sprites to hop between phones. The Nokia 6131 didn't seem to be able to do that (without writing an application for the phones, which we didn't have the time or cash for), and the solution we devised of sticking chips on the back of the phones didn't work well enough to risk. So instead I wrote some enchanted food into the storyline, and players meet to exchange chocolate bars with sprites trapped inside. As it turns out, this seems to fit very nicely with the fairy story, Alice in Wonderland feel I've been trying to create. That's the installation kit for Five Trees Forest - posters, magic chocolate bars (NFC enabled! ), comments book, landmark posters (with an NFC chip stuck on them), and they all fit in the big green magic box. On Friday afternoon I spent fifteen minutes going round the building with posters and blu-tack putting up posters, and hey presto, a building is turned into an enchanted space. That's the Museum of Lost Things on the door (the Museum is always closed otherwise you'd go in and find all the things you'd lost, and there would be no exhibits left). Because we are using NFC enabled mobile phones, I'm hoping that players will need hardly any introduction in how to play - just a demo of how to use the phone to read the NFC chip and that's it - the game itself should tell them everything else they need to know. To test that out I've tried to give the players as little technical instruction as possible, and I'm not even going to hand the phones out to them myself - I'll show the receptionists in the building how to use the NFC function, and they'll show the players, who will pick up their phones and begin when they come to reception to collect their post in the morning. Anyone who has ever installed and run any sort of pervasive game event using technology, which can get to theatrical levels of complexity and faff, even down to pains-in-the-arse like the wifi not working in the venue, will be standing up and applauding me right now. And creating a mixed reality infrastructure using posters takes me right back to City Poems. Five Trees Forest is a pervasive game played with Nokia NFC enabled mobile phones. The Five Trees Forest is an invisible world that is in exactly the same place as our world. 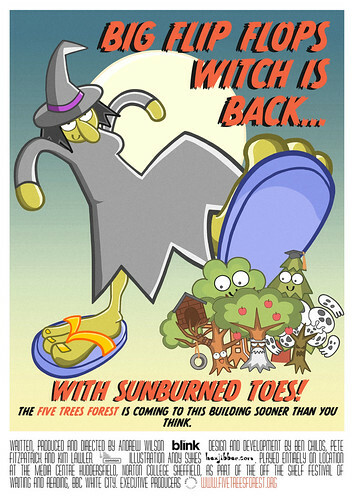 and baddies, wicked witches like the Big Flip Flops witch. The only creatures that can jump between our world and the Five Trees Forest are sprites, and when they are in our world, sprites like to live in mobile phones because the batteries keep them warm, and the radio waves make them giggle. To pick up and drop off sprites from the Forest, humans just need to hold their phone up to the secret signs that mark places in the Five Trees Forest landscape, and their sprite will hop into or out of the phone. Sprites talk to humans by sending messages that appear out of thin air (humans sometimes call them text messages), and ask magic questions like "If you were a ghost, who would you haunt and why?" in order to win treasure, and fight the wicked witches. The answers to the magic questions from all the players appear on the map of the Forest, so that humans become part of the story and history of the Five Trees Forest wherever it appears. The Five Trees Forest will be found first in a trial at the Media Centre in Huddersfield, then at Norton Sixth Form College in Sheffield as part of the Off the Shelf literature festival, then at a secret location in London (it's a very large media organisation, but that is TBC). A write up of the new Nokia 6212 NFC phone on the Touch site includes a photo of two phones side by side, exchanging information via NFC. This reminded me of how convincing and right it looks to put two phones side by side to do something together. When we were commissioning short films to be played on mobile phones, a couple of the films needed to be played out on two or more phone screens simultaniously. These films were slightly more succesful in the concept than the execution, but what was clear straight away, as soon as you put two phones side by side on a table top, was that it fitted in exactly with how mobile phones were and could be used. Ready for a run through of Five Trees Forest, with a Nokia 6131 NFC phone, and NFC tags that allow sprites to jump between our world and the Five Trees Forest. We've found with Nokia 6131 you can't use NFC phone-to-phone, and one of the events I wanted to happen in the game was for pairs of players to have to find each other and swap sprites, so we've had to improvise and stick an NFC tag on the back of the phone to enable that interaction. Though the new Nokia 6212 does do phone to phone according to Touch.